The Local Development Finance Authority of Huron Township had several openings due to elections of Trustees to Huron Township government roles. Currently the board is still confirming positions, but one newcomer to the LDFA, Matt McCormick is optimistic for the future growth of the Huron Township area. Matt McCormick found out about the LDFA through a long-time friend who served on the board. He has always had an interest in the group after his run for State Representative a few years ago and other political endeavors with the local government. Being a resident of Huron Township for the past twelve years and tax payer advocate, when a seat became open for a Citizen position on the LDFA board, he was eager to serve. In his own career background, McCormick has built over two hundred manufacturing clients and has an extensive knowledge in marketing and the industry. With fresh ideas for the board, McCormick feels the LDFA has done a good in laying the ground work for building relationships with companies and being known as a very cooperative Township to do business with. Aware that the group also has made a big economic impact in the LDFA district over the years, he is also committed to making sure that continues. He thinks a campaign should be directed at the tax payer target market and that campaign should communicate transparency and hold the commission accountable for the funds and growth within the LDFA1 and LDFA2 Districts. “One way we can do this is to post all the agenda and minutes on Facebook, send a monthly newsletter and to be more interactive on the LDFA social media sites with residents.” Said McCormick. 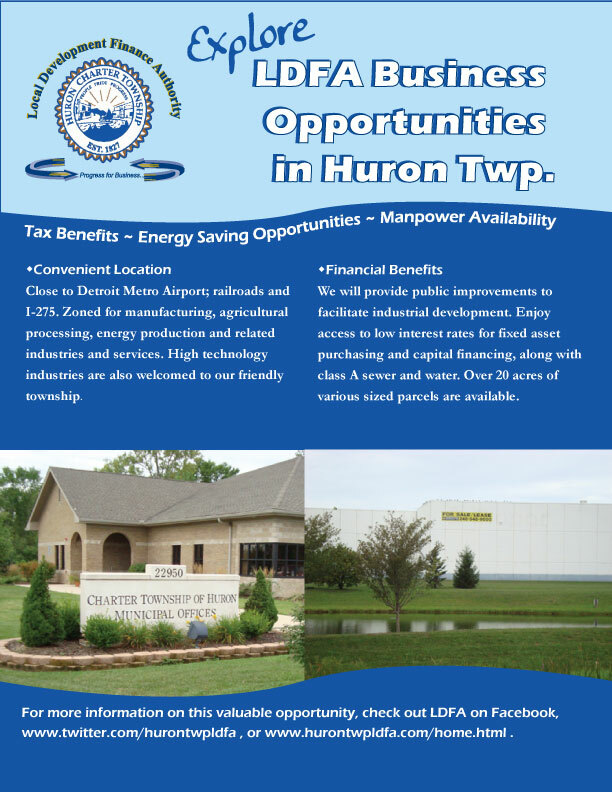 The Local Development Finance Authority of Huron Township exists to provide public improvements necessary or desirable to facilitate, promote and sustain industrial development within the established district. Prev:Huron Township, MI. Join other successful manufacturers in our LDFA District. Next:LDFA Success Leads to Growth of Huron Township Job Base. I think Huron citizens would like to know more about the large sum of revenue that has been captured by the LDFA and what future improvements to this district are planned to entice new development? Not just monies spent to improve existing companies. Your new site is informative and I compliment the writer. Welcome Mr McCormick! New face, new ideas. The statement referring to monies being spent on existing companies is a good question. I think the actual increase in jobs is incorrect. You may want to look at the number of employees at some of the plants. Large turn over at the one plant and present lay offs at other plant. The public should be informed of anything that may be coming into the township. I.e. Clearing of the large area by the railroad track a crossed from Chapps. I think the LDFA should be televised for the public to see what happens at your meetings. Just a suggestion. Again welcome.